I read about Vibram Five Finger running shoes from Michael Hyatt. I’ll admit I’m curious. After my Chi Running course (where I learned to run with a mid-foot strike), I want to try these ‘gorilla shoes’. First, I need to break my overly-coddled-way-too-padded feet into the concept gently by downgrading to a lighter, less structured running shoe. I headed to the bricks’n’mortar storefront for RunningShoes.com on my quest. It was a surprisingly enjoyable experience. When I hit the gym last night to test my new shoes on the treadmill, I reflected on what made my experience great as opposed to adequate, good or just plain fine. I have a retail store (OtionSoap.com) and have a vested self-interest in providing ‘great’ experiences to customers too. Finding the clear differentiator between first-rate and fine isn’t always obvious. 1. The store presented well. When I walked into RunningShoes.com, the store was lit well, organized and clean. It was easy to see everything. Prices were clearly marked. 2. The employee presented well. 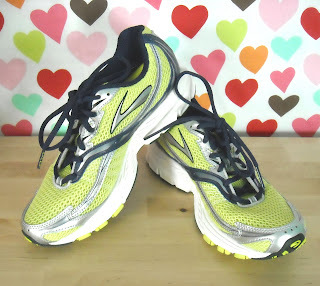 “Matt”, my RunningShoes.com specialist was friendly, knowledgeable and took delight in finding me the perfect shoe. He greeted me with an open-ended question “What can I help you find today?”. It was clear he was there to help and thrilled to do so. He watched me walk and run for a couple minutes, asked questions about my running habits and then came back with my perfect shoe. I bought the first pair he brought out (though did try some extra ones out just to be sure). Takeaways for my retail store: 1. Re-commit to an aggressive cleaning schedule, revisit the store layout 2. Train Otion’ites to always start with open ended questions and come out from behind the counter to greet new visitors 3. Always feel delight when given the opportunity to help. I’m curious – when you’re in a retail store, what really makes you walk away and go ‘Wow! That was genuinely a good experience“? These shoes are cute and has unique style. I think my wife and my kids will definitely love it if they'll get to see it. And with regards with great customer service, it's nice to know that this company has great customer service. Companies with good customer service are one of the main reasons why clients will remain loyal to them despite of economic problems. Call center associates or even the ones that we can see at some malls are trained enough to handle different kinds of customer concerns and queries. Great post! I heard about Vibram Five Finger runners from Tim Ferris (who always has interesting things to share). I haven't tried them yet, but plan to. Meanwhile, I had a choice between Brooks and Mizuno and ended up buying the Mizunos. They felt just a bit better on my feet. I also had a good buying experience, made even better because a friend, who is an avid runner, accompanied me. Great post! I went through high school working retail. And, in my day……..
1) The customer is always right. (Unless they are lying, stealing, or trying to cheat your store). At least you can make them think you feel that way. 3)Don't just point with a bored look while chewing gum with your mouth open. Actually tell the customer an aisle number or offer to show them the way. A sales associate(middle aged) actually walked me halfway across Walmart last week while I could not find wall calendars in either the office supply or paper supply aisles. I was so impressed at her attitude. 4) Then finally, after doing all you can do to help, leave the customer alone after informing them that you are there to help. Stop by periodically to offer assistance or get them a new size. Some of us get really stressed, depressed or shell shocked when shopping, so less might be more for those of us in dressing rooms during the height of bathing suit season under flourescent lighting, in front of full length mirrors, and about 6 inches away from glaring white fatty deposits on undesirable body parts with a whole rack of clothes that are 2 sizes too small. In that case, less is definitely more. Back in the day when I was a department manager, several customers expressed appreciation while I offered complementary ensemble suggestions to them. They seemed to appreciate me putting a whole outfit together for them complete with shoes, belt, scarf, sweater, jacket, etc. And, since you asked, I will also offer this: Office Depot absolutely enraged me recently. I had all these expensive ink cartridges, and labels that I wanted to exchange for others or store credit. One sunny afternoon, the sales associates were in the front area just standing around. I went up to the front counter and asked to return. The 20 something young lady and her 20 something young male associate emphatically and very rudely, loudly, and bluntly said, "oh NO!, we DON'T! accept returns! blah blah blah." Nope we DON'T yadayadayada…. Her attitude seemed gleeful versus my despair. I was so ticked by the time I left the store that I was embarrassed. Where did the verbage, "I'm SO SORRY, Ma'am, truly I AM, but our store policy has changed somewhat and I'm afraid now we cannot refund your purchase if it is X amount of days old…..etc. etc. A kind approach or compassionate attitude would go a long way to softening customers these days. I agree that genuine interest in the customer's needs is key. Thinking, "How can we help this customer attain his/her goal today?" rather than "I need to make a sale" goes a long way toward creating repeat customers. It is possible to "sugar sweet" or push someone into a purchase, but it is no way to build a returning customer base. So, smile, but mean it, is the name of the game! PS – I own a pair of the Vibram Five Finger Shoes and I love them so much, it totally does not matter what they look like! When I walk into a store, I want to be LEFT ALONE to browse. If I want help, I'll ask for it. At that time, I expect service. Knowledgeable people who know what they are selling is a must. I want an employee to be able to answer my questions. Is this product better? What are the pro/cons of this? I don't necessarily need a smile (especially a "its part of my job" smile) but I do expect acknowledgment. "Hi, welcome to ….. My name is ……If you have any questions or need any assistance please let know and I will be happy to help." This way is upfront and direct without the employee being my shadow. It is important to me that the person ringing my order up seems happy that I am purchasing something. It doesn't happen often enough! Smiles don't cost the employer/employee much but lack of smiles MAY cost my loyalty! I love shopping in a store where the employees know their products inside and out, and they are willing to share their time explaining things. You've written the book on customer service, Anne-Marie- I've never had a bad experience with your company! Nice to have something finally dethrone the Crocs from "ugliest shoes on earth"! I *heart* my Crocs! But the idea of having things between my toes is very strange, I never liked those types of socks either ;)plus I have a fat big toe, so they probably wouldn't fit me properly. Those "indian" sandals in the 80's were also not my friends (the ones with the ring for the big toe)… 😛 as for service. I loathe when store people tell me "I don't think we have that" but don't bother to ask or check. Or "I don't know" and then just stare at you like you were inconveniencing them. I always reply "well, would you mind finding out please?" tee hee! urgh – sorry to say, but I loathe american customer service in shops. It may be because I am a German living in the UK, but every time I enter the Disney Store, I just want to run straight back out. Within seconds a sales girl will approach with the widest grin ever and ask me "can I help you?" – aargh. Yes, by disappearing ! Same with Lush. Since about 3 months they do exactly the same thing in there. My friends don't like it either, so it isn't just me. I find it irritating, pushy, and way too sickening sweet. It immediatly puts me on my guard (what is she trying to sell me that I don't want). I much prefer to have visible and approachable sales staff, that I can see when I enter a shop, but that doesn't immediatly approach me. Actually, reading back on this, I know why. It screams of "I haven't seen a customer all day and now I am desperate for a sale". Desperation never makes for a good sale (even if it isn't the case, it feels like the sales girl/guy is desperate). Hover around by all means, smile, if I look at you and acknowledge me if I approach the service desk, but don't approach me with a cheesy grin and "how may I help you today" – I might just take a runner and never come back. I love good customer service! One of my pet peeves is when I am investing my TIME, GAS and energy to actually come to their store for shopping and service and the telephone is more important the me standing at the service desk asking for help! After all, isn't it the customers who actually walk in the store that are more likely to purchase additional items? You would think we would come first. This is what I like to see done and this is what I do myself. Start with a smile Acknowledge within 60 seconds, Approach within 3 minutes. Ask a few open ended questions, present your product knowledge (features) that directly relate to the customer needs (benefits for them) Suggest an add on of a complimentary product and close the sale. Remember that you can't close every sale but by being open and helpful that particular shopper is more likely to return to you for a future puchase. Don't let any difficult situation get to you… if puts you off and it almost always shows. Interestingly enough, I just happened to be working the retail store this afternoon (to spell Erik when he went to go grab lunch) and I had to consciously remember the open ended questions – and think about how to juggle 4 customers at a time, with my hands immersed in soapy water. For those of us that do not have a store front, I like the thought of a revamp in customer service. How can we help our customers have a "wow" experience that they treasure…whether it be let them browse, or whether it means guide them through the store. Generally it is a combination of both. Helen, Gosh what a great story. Thanks for sharing that. =)) I will be sure to give the ELFman (my nickname for Erik) lots of props. Josee, You are totally spot-on about the name thing. I love it when my regular shops remember my name or details about my purchases. It makes me feel valued. T.A. A smile can make all the difference. Having happy, bright, shiny people in a store really sets a great atmosphere, IMO too. One thing is always present when I can say I've had a great experience in retail…a SMILE! If a sales person either walks up to me or if I walk up to them and they look at me and smile that sets the tone for the entire time. friendly manner. When i worked the video store during my studies ,we'd answer the phone with the name of the store ,followed by our name . It always amazed me how many clients came in later ,asking for us by our name. 2)Salesrep need to know their products to sell them ,it makes them more convincing when making suggestions. We would always go home with movies to watch in order to be able to recommend them . 3)Everybody loves a good deal. Advertising specials in the "store" will attrack customers. I always enjoy employees who know when to leave you alone and let you browse but are available to answer questions. Nothing is worse than being followed around a store when you're just checking stuff out! Not a tip, but just a nice comment for you: the first time I visited Otion I didn't know there was parking in behind, so I parked at the meters out front. I only had a couple of US coins (I'm Canadian) and was running out of time and Eric ran outside and coined my meter so I wouldn't get a ticket. That's what I call customer service! Hi Heidi – I bet you're totally going bonkers without being able to work out. I get sort of moody when I can't work out. Are you reading any good books? The in-person thing is so important versus the phone – good one! Wow…I love how you think and the way you are always thinking! I think the agressive cleaning thing is SOOOOO important and then those great open ended questions and always upselling! Maybe have a contest for your sales associates…for upselling. Turning that 20 sale into a 40 dollar sale…etc. And last but not least, always dealing with the customers in the store before the customers on the phone. Nothing is worse than walking into a store and being ignored, because they are blabbing on the phone. I am sure you hire people like yourself who are warm…..I am positive that goes without saying for you 🙂 I have a lot of time to sit and think right now! I can't wait to get back to my workout routine!!! It's driving me nuts sitting around all the time. Hopefully another week, I can lift enough to make some bath bombs or soap! XO Heidi Outre Beauty Bistro on Etsy.